Okay Cleveland experts, here's a question for you: In a book about black heritage sites in the northern United States, only two such sites are listed for Cleveland. What are they? Okay, one is pretty easy: the famous Karamu House. But the other certainly isn't. Did you know Cleveland had an African-American Museum? I sure didn't. At first, I thought the listing was nothing more than a reference to the specialized African-American collection at the Western Reserve Historical Society. But it turns out there's an entirely stand-alone collection housed in an old Carnegie Library. It was conceived by one visionary Cleveland man, and later housed in the basement of the Hough branch of the Cleveland Public Library. I, for one, plan to visit soon. The web gossip Matt Drudge is forever linking to articles about himself in various media. Naturally, they tend to be largely celebratory takes, and there have been plenty of those, given his ever-growing influence (not long ago, the editor of Washingtonpost.com noted that as much as 40% of the site's traffic comes via links from the Drudge Report). But the man behind the site has managed to largely remain hidden behind his latter-day Walter Winchell schtick. Until now, that is. Though Vanity Fair and a couple other outlets have done good work peering behind the Drudge curtain, this profile in last week's New York Magazine is the best, most comprehensive and balanced rendering of the guy I've seen yet. Just don't expect to see Drudge calling attention to it, since the warts-and-all treatment, while not unsympathetic, discloses plenty of personal material that will make him wince, and in his myth. Its author is an interesting writer named Philip Weiss, who's perhaps best known for his work for the New York Observer. Four years ago, I explored the subject of Matt Drudge and his Drudge Report in two consecutive posts, here and here. There was a touching piece in today's New York Times about the late David Halberstam, and how his work is being continued even after his death. It seems that some of his more famous writing comrades (including Bob Woodward, Sy Hersh and Joan Didion) are going to pitch in and donate their time this autumn in helping to do a book tour for his new, posthumously published book, The Coldest Winter: America and the Korean War. There's a pleasing symmetry to this story, the Times notes. Many years ago, after his friend, the writer Anthony Lukas, had died, Halberstam had arranged for some writing friends to represent Lukas's book at bookstores around Boston. Shortly after he died this spring in an auto accident, I wrote this tribute to Halberstam. The great one also spoke from beyond the grave in this powerful essay about the Bush White House's use and misuse of history, published in the August issue of Vanity Fair. 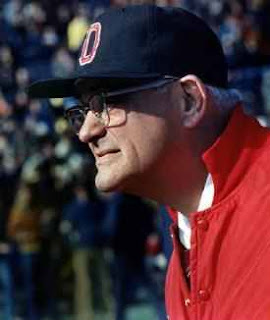 Did you know that the late Ohio State football coach Woody Hayes, whose career came to an end after he punched an opposing player on the sideline, has an academic chair named in his honor? Well, he does. Given his popularity (despite the punch and his general irascibility), that's not too surprising. But the subject is a tad surprising: the chair is in national security studies. We think this might just touch off a trend in academia. We can look forward to the Paris Hilton chair in molecular biology and the Donald Trump chair in particle physics. --William Burroughs, in Remembering Jack Kerouac. Not long ago, I also noted this favorite bumper sticker expression. 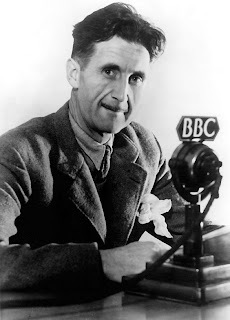 --the late and visionary journalist and author George Orwell. Earlier, I mentioned the great one here, and linked to his celebrated essay Politics and the English Language. The latter is just as worthwhile to read today as it was on the day it was first published. --Bill Moyers, the thinking person's omnijournalist, addressing a conference of journalism educators last week. Earlier, I mentioned Moyers here and here. 'Who are you indeed who would talk or sing to America? Have you studied out the land, its idioms and men? --Walt Whitman, in By Blue Ontario's Shore. Earlier, I linked to an online archive of Whitman's writing. 'Q: Well, what happens if we let the income gap remain? 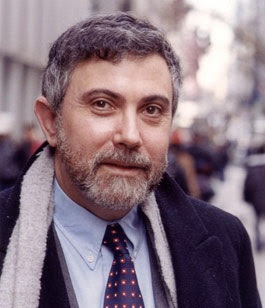 --from an interview with economist and columnist Paul Krugman, in the September issue of GQ Magazine. We'll be quiet today, however, while we spend the day in a true rite of passage moment: taking our eldest child to college for the beginning of his freshman year. A couple of years ago, I wrote about an early foreshadowing of the experience. Now, it's the real deal. The whole endless debate over Wikipedia and the so-called democratization of information has seemed more than a bit tiresome to me over the years. The extreme edges of both camps seem about equally clueless to me--both the critics who seize on every Wikipedia shortcoming to make a larger (brainless) critique that nothing found anywhere online can be trusted, and the hard-core Wikipedia defenders who try to argue that a mob can somehow cobble together information that's every bit as dependable as that which is compiled by rigorous, learned and professional editors and subject specialists. I think the truth lies somewhere in between. Yet another log got thrown on that endless raging debate with the publication of this front-page piece in today's Sunday New York Times. Stop the presses: companies and institutions with an interest in various bits of information have themselves gone in and changed many entries. That this should even be news speaks to the Wikipedia community's wishful naivete: how shocking that corporate and other moneyed interests, when given the chance, would try to look after their interests in this way, just like they do everywhere else. Who says old-fashioned newspaper hijinx died along with the migration from hot type? You have one more night--tonight--to enjoy the annual Feast of the Assumption in Cleveland's Little Italy neighborhood. For Clevelanders, it's the one chance each year to experience Manhattan-like human density without leaving home. We spent the entire night there last night, and the nice weather may have drawn the most people ever. You could barely walk in most places. But the food was great as always (I'd especially recommend the lemon ice from Corbo's and the gnocci from Gusto's), and the music even better. Last year, I wrote this about my dad's Italian band, which has been the featured musical attraction for the last several years. They're on hand again this year. Dad is the guy wearing the funny hat and playing the mandolin. Amid the dreary cattle call of late-night TV interview shows, few famous names stand out. No matter how famous, how attractive or how articulate they might be, they mostly all say the same thing, trying their best to manufacture some new blend of hipster freshness or "rehearsed spontaneity," in a ringing phrase I recently came across. But beneath it all, they're all selling their latest movie or TV show or whatever. 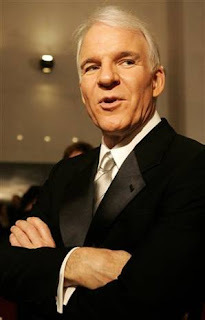 And yet, more than 30 years after he first blasted onto the national scene with his hilarious stand-up routines (a kind of neo-Buster Keaton with a '70s twist) and stomach-splitting Saturday Night Live character sketch brilliance, Steve Martin finds a way to remain as fresh as ever, at least for me. He's done that in part by engineering his own improbable mid-career make-over: he's now at least equal parts writer and comedian. He's written several well-received books, and has followed Woody Allen's earlier lead by writing several comic sketches for the New Yorker. However much fame he may have accumulated from movies and live appearances over the years--which is not inconsiderable--if you take his recent appearances at face value, he now sees himself primarily as a writer. And yet in his signature brilliant fashion, he finds a way to make it all work together, these twin veins of writing and comedy. His appearance last week on David Letterman is the latest case in point. He talked mostly about writing, and then, in a roast of the ritual film clips other actors bring along to these shows, it cut to a clip of him...writing. The clip consisted of him sitting silently in front of a Mac laptop, staring into the screen without moving or saying a word. That was funny enough. But the punchline (when the clip was finished, and the camera returned to him and Letterman) was much funnier: "I wish they had cleared that with me, because that was actually a clip of me editing." --from a brilliant piece of writing and thinking in the June issue of Smithsonian magazine, written by a former U.S intelligence officer. He crisply explains the vast differences between how spy agencies must crack the intelligence codes of Al Qaeda (a mystery) and the former Soviet Union (a puzzle). This is an often-overlooked publication, but one of a handful that continue to regularly publish sparkling long-form narrative journalism. --author Anne Lamott. To review my earlier mentions of this sublime word sculptor (some brief, others substantial), go here, here, here, here, here, here and here. And for the record, I fully agree with my friend Jeff Hess's assessment that her fiction doesn't begin to hold a candle to her essays and memoirs. But then, perhaps that's only because we're guys. And you know how clueless they can sometimes be. 4). Write even more than that. 5). Write when you don’t want to. 6). Write when you do. 7). Write when you have something to say. 8). Write when you don’t. (this list comes courtesy of the Copyblogger blog, which makes a persuasive case that good copywriting and good blogging have much in common. "Good blogging and good copy share many of the same attributes — plain spoken words designed to focus on the needs of the reader by using stories, education and a clear demonstration of benefit and value. In an overly-crowded marketplace, copywriting allows you to catch people’s attention, and smart blogging allows you to capitalize on that attention by building trust, sales and profits." 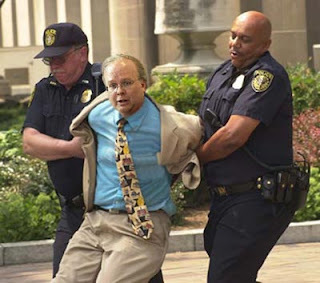 ...We're just glad to see the thuggish schemer, Karl Rove, leaving. We'll take it any way we can get it. But a note to Congress: don't go any easier on him in trying to get to the bottom of his part in the Bush White House's manifold desecrations of the Constitution. The target on his back should remain as large as ever. Meanwhile, in the interview with the Wall Street Journal in which he broke the news of his impending resignation, you can read the scariest five words imaginable: "He'd like to teach eventually." --New Republic literary editor Leon Wieseltier, writing in the magazine recently about "our tacky gilded age" celebration of extreme wealth. --From The Female Brain, by neuropsychiatrist Louann Brizendine. --a woman explains why she refuses all offers to sell her house, in an article in the current Vanity Fair on the booming popularity of Italy's Lake Como region ever since actor George Clooney became a resident. Conde Nast's Portfolio Magazine is about to unveil its second print issue, and some readers (including me) are waiting with interest. We're wondering if the second will be nearly as bad as the debut issue, which was roundly (and rightly) panned. Its editor, Joanne Lipman, earlier presided over puffing up the Wall Street Journal with soft lifestyle coverage, but she has thus far turned out to be an unqualified disaster as a magazine editor. Working with all the advantages of the deep pockets of Conde Nast (publisher of the New Yorker, among many other well-known titles), she produced a whole lot of nothing special. So the sharp knives will be out for this next issue. Anyway, the magazine's companion website, which still considers itself a work in progress (it labels itself "beta"), just published a list of what it considers the most obnoxious examples of business jargon. Like the magazine to which it's married, it's disappointing. The editors seem to have spent about 11 minutes thinking about this one. But they did make a start. How about yours? Any favorite awful business jargon you'd like to add to the list, via comments? Last year, I posted some outtakes from a much better book-length effort on this subject. The book was entitled: Why Business People Speak Like Idiots--A Bullfighter's Guide. Not long ago, I noted a couple of important events in the life of my friend and mentor Bill Gunlocke: his 60th birthday and his new blog. I'm happy to report now that he has even much grander news: he's the new executive editor of New York Press. I learned the good news from him in an email flash a couple days before the news broke, but now that it's out there publicly, I hope you'll join me in wishing him well. Clevelanders who remember him from his years as founder, editor and publisher of the Cleveland Edition can drop him a note of congratulations, at bgunlocke@manhattanmedia.com. Though he's lived in NYC for a few years, he has been following things in Cleveland, via a close reading of the Cool Cleveland e-letter. There are a couple of especially interesting details about this deal. The Press's new owner says he'll refuse explicit X-rated ads (the NYTimes' excellent City Room blog noted that the decision was applauded by the National Organization for Woman, which estimates it could mean as much as $12,000 of lost revenue each week). Bill's decision to do the same with the Edition (he refused alcohol ads too) was to his credit, but it no doubt helped spur the paper's demise. (I recall Mike Roberts shamefully gloating about this at the time in Cleveland Magazine). And the NYPress, long positioned as the alternative to the dominant Village Voice, will now be going head-to-head with a paper which the Phoenix-based New Times chain--owner of the Cleveland Scene--has all but gutted. An additional irony: while Rupert Murdoch owned the Voice for several years and mostly left it alone, the working-class-hero libertarian tough guys at New Times have basically ruined the paper in just two years of ownership. They had the gall to rename the chain for the Voice even as they were eviscertating it and weeding out all the strong editorial voices that have helped it achieve its famous name. But therein lies an opportunity for Gunlocke and Co.
One of the reasons the Wall Street Journal has come to be so beloved and trusted among serious readers and serious writers everywhere is the paper's uncanny habit of getting its facts straight--at least in the news pages. Over a century, it built a unique newsroom culture that was probably the purest expression anywhere of the group pursuit of factual accuracy. It's a culture that seems unlikely to survive its new owner, Rupert Murdoch. But factual accuracy isn't simply about getting things right. It's equally important not to miss important facts, the kind of facts whose absence can render the point of a story all but moot. I thought about all this when I read a story in the Plain Dealer last Wednesday about a plan to merge the Cuyahoga and Cleveland bar associations. Written by Alison Grant, it was a workmanlike late-summer piece that wouldn't ordinarily attract much attention. At least until I read her summary of why this region happens to have two bar associations: ancient cronyism and ethnic bigotry. Actually, as anyone who has spent any time at all around the Cleveland legal world should know, the older Cleveland Bar has historically been comprised of defense firms and their lawyers, while the Cuyahoga Bar has been mostly home to plaintiff's lawyers. If you know anything at all about the law, you should know that division represents a giant cultural chasm and a real divergence in their outlooks and interests. Okay, so it would have been one thing if she was merely one of those college students on a summer internship that I wrote about recently. In that case, you'd mostly lay the blame at the feet of her editors. But that's hardly the case: Ms. Grant is a veteran reporter who was a Pulitzer finalist in 1996, for her devastating series of investigative reports on city hall corruption in Beachwood. Let's be generous, shall we, and chalk it up to a case of the summer blahs. Here are a few things I've come across recently that I thought worth sharing. Money & Flattery Will Always Do It. Washington Post media critic Howie Kurtz shows how The Atlantic's owner David Bradley lands top journalistic talent: through a mix of "smart-bomb flattery" (sometimes playing out over several years) and paying salaries as high as $350,000. That's a pretty powerful combination. On the other hand, Slate's Jack Shafer last year documented the other side of Bradley's niceness. He called him "a narcissistic and needy bore." I Spoke Too Soon About Cindy Sheehan. Only last week, I wrote about antiwar activist Cindy Sheehan's decision to retire from public life. But in a newly published Q&A with Sheehan, Radar Magazine breaks the story that she's rethought her retirement. Why? It seems she was outraged by Bush's decision to commute Scooter Libby's sentence, which she calls "another act of treason." Unfortunately, she still seems haunted by some of the tone-deafness I mentioned. In the interview, she brags about getting backstage passes to Rage Against the Machine concerts because she's friends with someone in the band, and suggests she's just as qualified for leadership as House Speaker Nancy Pelosi. "She's speaker of the House and I'm a nationally known figure," she says (cue the rolling of eyes). She also describes how she's positioned to the political left of Congressman John Conyers, which is not easily done. An Ingenious Circulation Device. 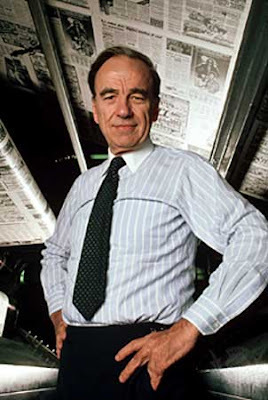 Longtime NYT columnist Russell Baker may be retired from daily newspapering. But he shows in this interesting essay/book review in the New York Review of Books that he's still closely watching and thinking about the changes buffetting his profession. And he seems to understand the power of the web better than many of those still working in newsrooms. He writes: "At present the Internet is basically an electronic version of the ten-year-old boy on a bicycle who used to toss the newspaper on the front porch: an ingenious circulation device." Sometimes You Find Great Writing in the Most Unlikely Places. And finally, I came across this nearly perfect sentence in an article in the trade pub Media Week, of all places. "Advertising is the intersection of Eros and Mammon, a dimly lit crossing where manufactured desire is sated by consumption, and it works best when it makes anyone who comes into contact with it crave something they don't really need." Hats off to writer Anthony Crupi. He proves once again that no assignment is too unimportant, and no audience too narrow, that it can't benefit from good, vivid writing. --San Francisco Chronicle columnist David Lazarus, in his final column, before moving on to another, unnamed, paper. We have a tie this month, folks. These two favorite opening paragraphs come from a pair of female columnists on opposite sides of the political spectrum. But both write exceedingly well. --former New York Times editorial page editor Gail Colllins, writing today on the NYT op-ed page. I'd link to it, but the column is locked behind the Times Select pay wall. --Peggy Noonan, in a column published in yesterday's Wall Street Journal. You can review past Best Lead of the Months here. We're in mourning here today about the imminent demise of a great American institution, now to be under the ownership of an unscrupulous, rampaging Australian billionaire. Our flags will hereby fly at half mast for at least the rest of the year. Today is a travel day, so no time to go into any detail (even if we could summon the mental energy to fight through our waves of nausea at the prospect of the onetime diary of the American dream being controlled by this person). But we'll take up the subject at length sometime soon.